ISLAMABAD, Pakistan (CNN) -- Security forces in Pakistan have started the "most important phase" of their push against the Taliban -- clearing militants from the largest city in the troubled Swat Valley region. 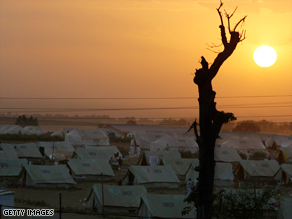 Tens of thousands of Pakistani civilians have been forced into refugee camps because of the fighting. "Today the most important phase of operation Rah-e-Rast, the clearance of Mingora, has commenced," the military said Saturday in their daily roundup of military activities. Tens of thousands of citizens from the city's estimated population of 300,000 have so far fled because of the conflict. Elsewhere in the Mingora region, exchanges of fire were reported as troops killed at least seven militants and seized caves that contained ammunition and rations. Security forces said they have made gains in the Peochar Valley, Matta and Dir areas of North West Frontier Province. One militant was killed in Matta and nine others were killed in Dir, the military said. "Security forces have successfully secured the vital Wanai Bridge linking Matta with Peochar," the military said. Pakistani Maj. Gen. Athar Abbas on Saturday said troops hope to do their best to end the operations in the next two months. The military push in North West Frontier Province has been focused in Swat and other various districts of the province's Malakand Division, such as Upper Dir, Lower Dir, Buner, Malakand, Shangla, and Chitral. On Friday, the Pakistani military claimed to have broken the backs of Taliban militants in the Swat region. The military showed journalists a system of bunkers and caves captured from Taliban militants earlier this week. The most striking thing about the scene was that roads were deserted in the Swat Valley. There is a strict curfew enforced. There are terraced farm fields, but there were no farmers seen harvesting the crops. A fire could be seen burning in Mingora from the helicopter. Fighting has displaced more than 2 million people in North West Frontier Province, 1.7 million since May 2 and 555,000 from earlier fighting. The scale and speed of this month's population flight is said to be the worst since the Rwandan genocide in 1994, according to the United Nations refugee agency. The U.N. started a drive Friday to raise $543 million to help the displaced in the region. The Pakistani military said Friday that 17 militants and three security force members have been killed in fighting over the last 24 hours. It said security forces were consolidating their positions in the Peochar Valley and in Shangla and Swat. It reported exchanges of fire in Takhtaband and the Dir and Buner areas.